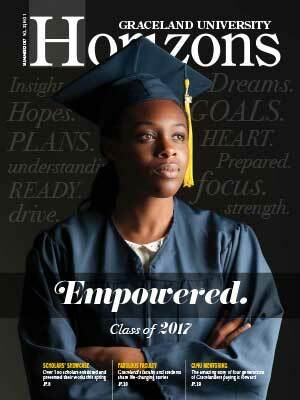 Read the PDF version of the Horizons. The 2017-2018 Annual Report of Donors is available for viewing in My Graceland. If you already have a sign-on to My Graceland. If you need a sign-on to My Graceland. 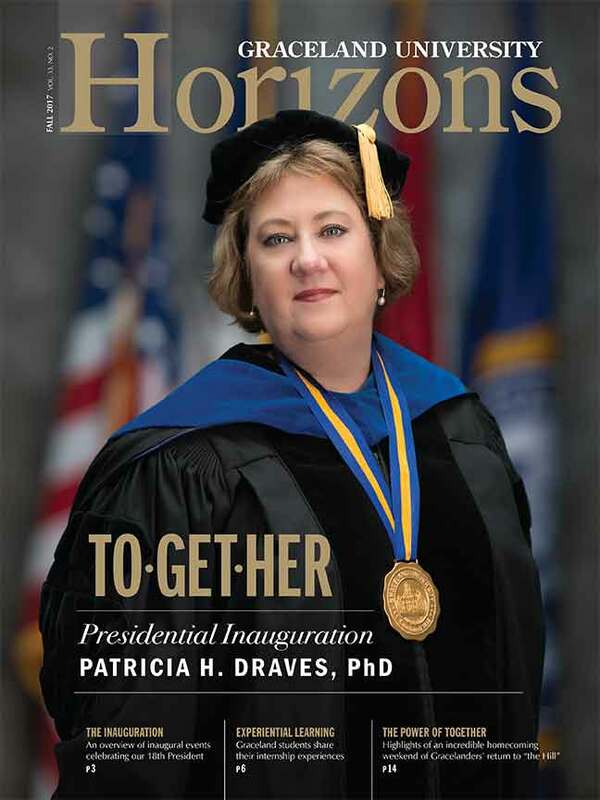 Horizons is the Graceland Alumni magazine. It is published three times a year by Graceland University, Lamoni, Iowa 50140. Send address changes to: Horizons, Graceland University, 1 University Place, Lamoni, Iowa 50140 or e-mail the Alumni Programs Office. 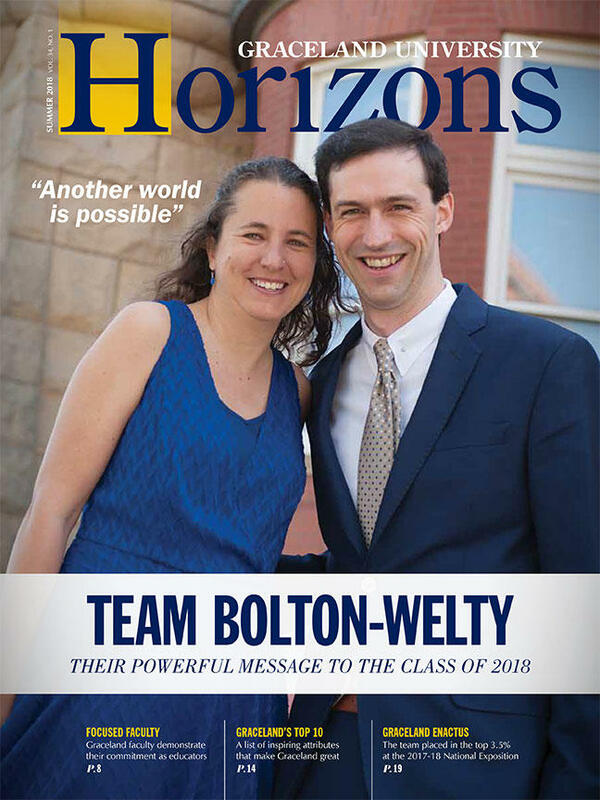 The magazine is distributed without charge to alumni, faculty, staff and friends of the university. Free copies are available upon request. Direct inquiries to the Graceland Alumni Programs Office at the address above, e-mail at alumni@graceland.edu, or call 866-GU4-EVER. 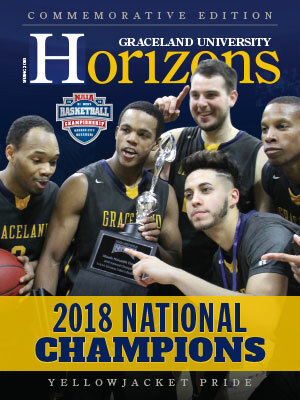 Submit class notes for the Horizons by completing the form, or you can mail your information to the Graceland Alumni Programs Office, 1 University Place, Lamoni, Iowa 50140 or e-mail your information to alumni@graceland.edu. 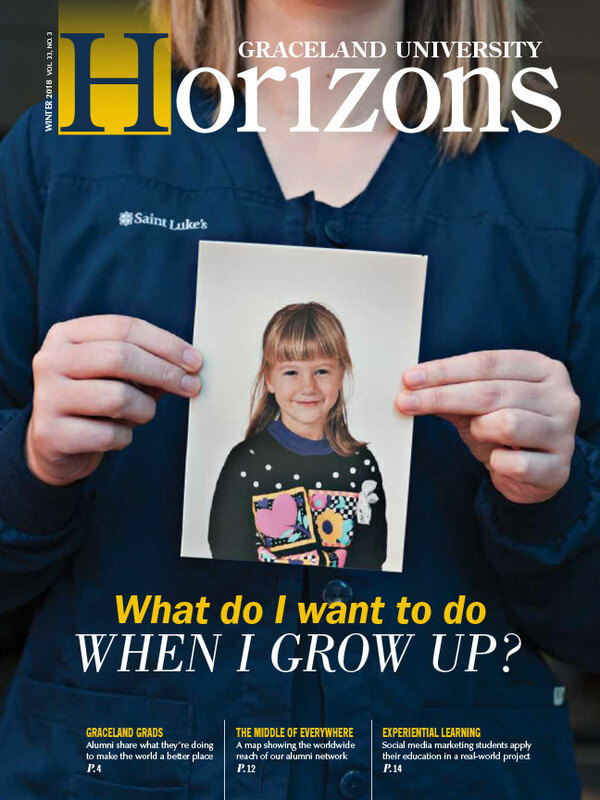 Many previous issues of Horizons are available online. "2018 Men's Basketball NAIA DI National Champions"
"What Do I Want to Do When I Grow Up?" "Reflections - a Presidential Transition"
"A New Brand - Uncovering Our Common Story"
"Ushering in a New Era"
"Our Legacy with JR and Carol Shaw"
"The Two Great Loves of Jerry Hampton"
"There's No Place Like Home, Homecoming 2010"
"Two Graceland Presidents Establish New Graduate School Opportunity"
"Resch Science and Technology Hall Dedicated at Homecoming 2009"